You are here: Home>Archive>Taylor Brown Collection.>Miscellaneous documents and objects.>Receipt from the Hill Crest Hotel. Receipt from the Hill Crest Hotel. 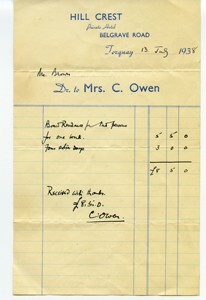 Receipt from Hill Crest Hotel, Torquay dated 13th July 1938 to Mr. Brown. The receipt lists payment for one week plus extra days board and residence for two, and totals £8:5:0. It is cream coloured paper with blue printing on it. It is handwritten in black ink.